Green SuperFood is a full spectrum of alkalizing green superfoods, antioxidant rich fruits, and support herbs unite with Acai and Maca to provide a powerful dose of whole food nutrition. 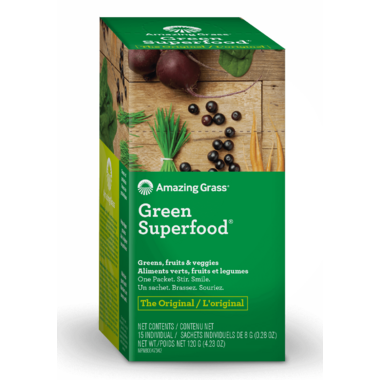 Amazing Grass signature superfood provides amazing energy and amazing health. Green SuperFood is blended to perfection in a delicious tasting powder that mixes well with juice, water or your favorite beverage. A full spectrum of alkalizing green superfoods, antioxidant rich fruits, and support herbs unite with Acai and Maca to provide a powerful dose of whole food nutrition. Suggested Use: One box of single serving packets, 15 individual packets per box. Serving size: one packet, 8 grams. Mix a packet with 8 to 16 oz of your favorite juice or water. We like orange, apple, or grape juice, or try it in a smoothie. Take it first thing in the morning to jump-start your day! We recommend 1-3 servings daily. Tasty, and mixes well. The single packets are wonderfully handy. Great taste, mix well with smoothies or juice. The single portions are useful.